This is a sunflower photograph I took recently. Warren and I were on a drive heading east in Washington state. We stopped in at Index which is a very picturesque little village nestled among the cascades and sits below Mt. Index. On the way home, we stopped in Gold Bar for lunch. I had the absolute worst meal of grease ever. I will spare you the details. I’ll just say that when traveling in small towns, Mexican is your best bet. While it may not be the best, it is hard to ruin a taco. One has to work incredibly hard to ruin rice, beans and a taco. After lunch, we came upon a poor little bedraggled sunflower plant in someone’s front yard. I have been seeing glorious fields of sunflowers lately. I was extremely disappointed. But I figured, what the heck. You never know. Well, I ended up with this beautiful photo. So, you never know when that one special photo will show up in your camera. This was taken with my iPhone 6 Plus camera on auto, using Camera+. I may have used macro mode, I forget. For post processing, I started in Enlight. That is my new go-to app. I have been a real fan of Snapseed and still use it. But I find that I can make some more subtle changes in Enlight. I especially like the Clarify settings under image. Those settings there seem to offer a bit different set of adjustments for sharp, saturation and black. Then I took this into iColorama in the style settings. Finally, I took it into Tangled Fx and used one of my custom settings. I love Tangled Fx. I like to make my own adjustments to their settings. I have about 15 special settings. I have a very special photograph today. It is my favorite body of all time, my husband, Warren and a new friend we met today. Kayla, a Rhodesian Humpback. She originated in Africa, where her breed are used to hunt lions. She is a beautiful dog, with a warm personality. She is missing her hump, however. 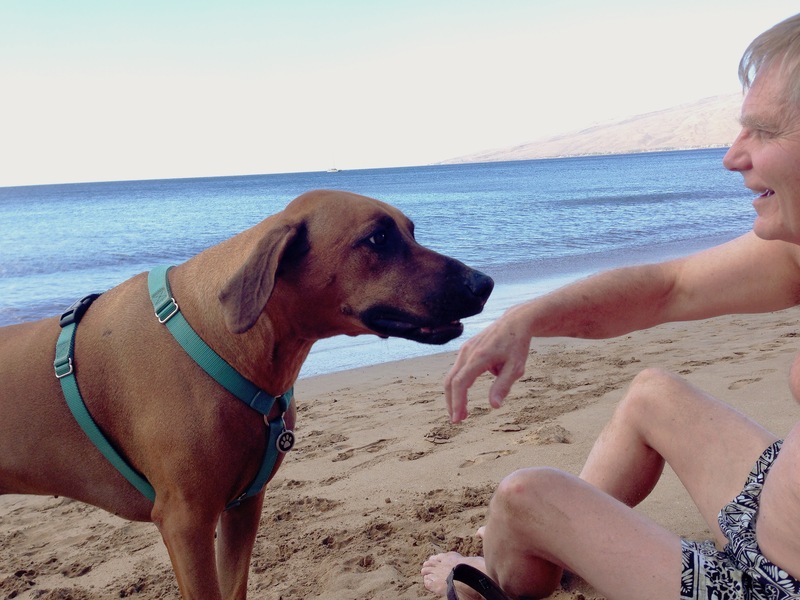 Kayla lives on Maui, where she loves to romp on the beach. This is another photo from my iPhone. 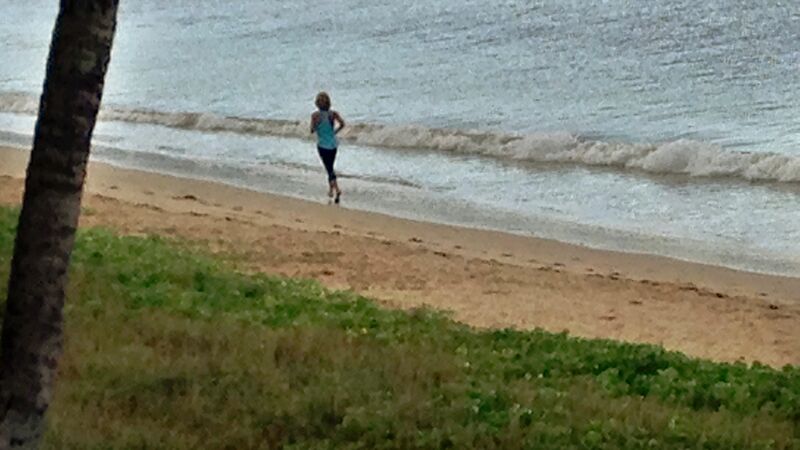 I thought of the old saying, “she runs like a girl” when I saw this woman running on the beach. Yeah, she does run like a girl, an athletic one. This woman comes out to run early each morning. I’ve tried to capture her for several days, but she runs too fast. I finally got her today on her return when she slowed a bit. I just can’t resist posting this picture. 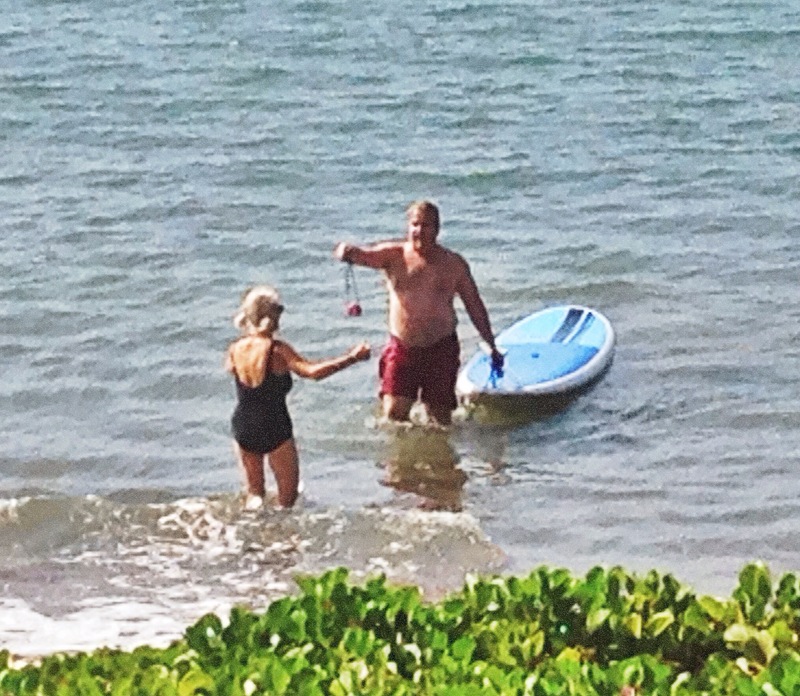 We could hear the wife telling this man to NOT go into the ocean on this board with his camera. He patiently explained to her that he was only going to be on his knees. He pointed out (sarcastically) that this way he could maintain perfect balance and not fall. This is a picture of him handing his wet, soaked camera back to his wife.